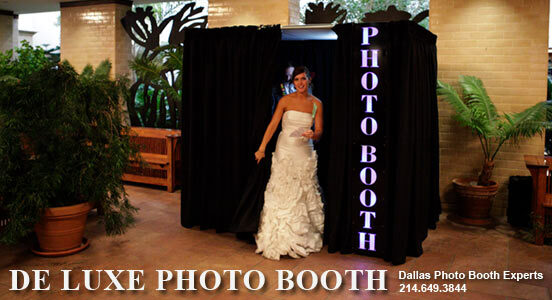 Photo Booth Rental in the Dallas-Fort Worth Metroplex. Two Different Photo Booth Designs To choose from. 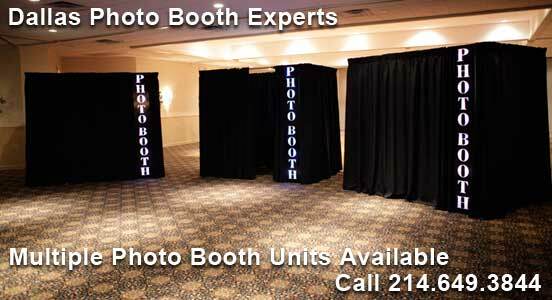 We offer two different Photo Booth designs to choose from. 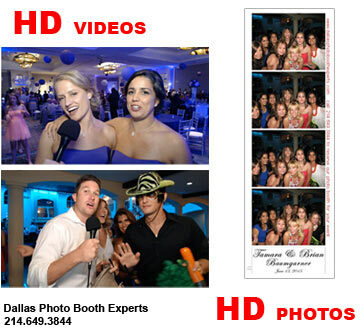 Both of our photo booths deliver the Highest Quality Photos and HD Videos. 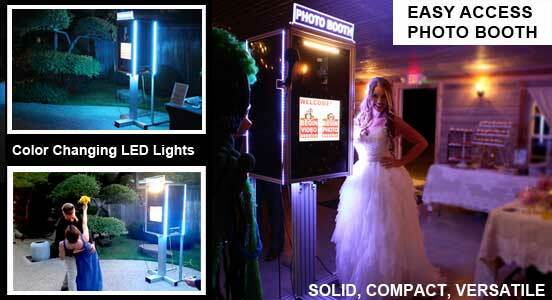 The Easy Access Photo Booth looks great and can fit practically anywhere due to its sleek and compact design. POWERFUL LED lighting on our booth assists in attracting your guests, while providing an ambiance that matches your wedding theme colors! 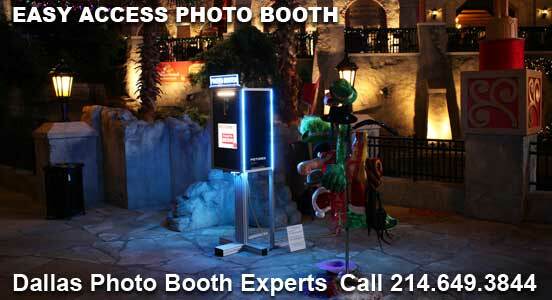 The dimensions of the Easy Access Photo Booth are: 6 FOOT TALL by 3 FOOT WIDE by 4 FOOT DEEP. The frame of the Easy Access Photo Booth is made of heavy duty aluminum extrusion. Aluminum extrusion provides an unbreakable sturdiness and elegant look. 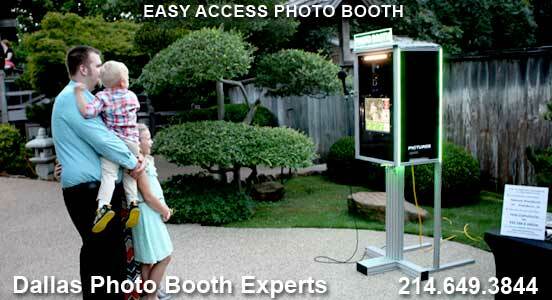 The Easy Access Photo Booth dominates the competition with its maximum quality and unique features. Photo Booth - takes, prints photos and records the photo session video bloopers. Photo-Video Booth - takes, prints photos and records HD video messages. Benefits: Open style (not enclosed), fits practically anywhere, handicap-accessible. Flexibility: Can be used as a Photo Booth, Video Booth or a Photo-Video Booth. REQUIREMENTS: In order to operate the Non-Enclosed Easy Access Photo Booth all you need is 4 foot by 4 foot area. NOTE: INDOOR and/or OUTDOOR* (*conditions apply for outdoor use). Looking for VIDEO BOOTH? We got it! The De Luxe Photo Booth has been designed and built by the Photo Booth Experts. The De Luxe Photo Booth is a FULLY ENCLOSED PHOTO BOOTH. With their all steel frames, our photo booths are sturdy and solid. We cover our solid steel frame with elegant looking black drapery that will fit any decor. In order to comply with the fire code our drapery is flame retardant. 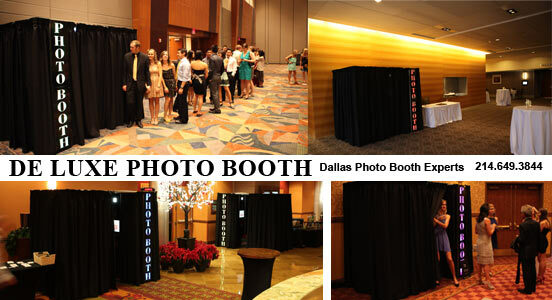 The De Luxe Photo Booth size is 5 FEET WIDE AND 8 FEET LONG. With its HEIGHT OF 7 FEET, it can accommodate even the tallest of guests. The De Luxe Photo Booth is group friendly and handicap-accessible. Our De Luxe Photo Booths can fit up to 12 people which means that everyone can join in on the fun. With our exclusive zoom in / zoom out feature, you are guaranteed to capture everyone in every image. The De Luxe Photo Booth has been designed to accommodate handicap participants. 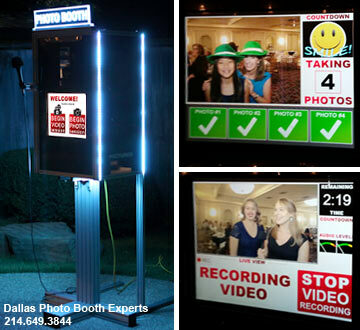 Our attention getting color changing LED sign will let your guests know that a PHOTO BOOTH is present at your event. Benefits: Fully Enclosed, Fits up to 12 people, Complete privacy, handicap-accessible. REQUIREMENTS: In order to operate the Enclosed De Luxe Photo Booth we require at least a 10 foot by 10 foot area. NOTE: INDOOR ONLY. 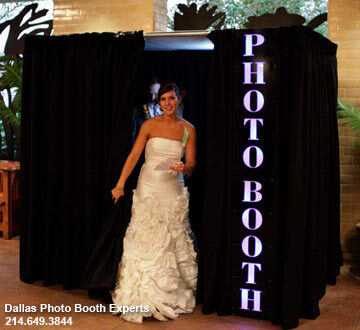 Choose Photo Booth design for your event Enclosed and Open-style Photo Booth and/or Video Booth for weddings, parties, quinceaneras, corporate events in the DFW area.